I'm a veterinary pathologist, graduated with a Doctor of Veterinary Medicine from the University of Teramo (Italy) in 2002 and a PhD in Ultrastructural Pathology in 2006. After completing a residency program at the School of Veterinary Medicine of Milan, I became a Diplomate of the European College of Veterinary Pathologists (ECVP) in 2009. Before joining UQ in 2012, I was a full-time researcher in Veterinary Pathology at the University of Teramo (Italy). My international work experience and collaborations include the Institute of Animal Production (Prague) and the California Animal Health and Food Safety (CAHFS) Laboratory System (Tulare, California, US). I'm the Postagraduate coordinator of the School of Veterinary Science and Director of the training programme for the ECVP board examination at the School of Veterinary Science (approved residency training center) and I assist in the supervision of the advanced training program in veterinary pathology for the ACVP and MANZCVS examination. Roles at the School of Veterinary Science: member of the Research Committee of the SVS, co-ordinator of undergraduate (VETS2007) and postgraduate ( VETS7704, VETS7711) courses. 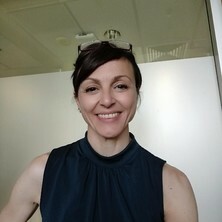 Research interests: comparative oncology (canine prostate cancer, osteosarcoma), reproductive pathology, evaluation of pregnancy losses and placental abnormalities associated with assisted reproductive techniques, ultrastructural characterization of neoplastic diseases in domestic animals, male reproductive pathology induced by Chlamydia infection in koalas, avian pathology. Professional skills and competencies: 1) Veterinary Pathology diagnostic service: necropsy, histopathology, cytology; 2) technical skills: histology, cytology, immunohistochemistry, fluorescence microscopy, transmission electron microscopy. Publications: 67 papers on international journals with referees, 1 paper on national (Italian) journal with referee, 2 scholarly book chapter, 15 meeting abstracts published on normal or special issues of referred journals indexed on ISI Web of Knowledge; 109 abstracts (in proceedings of Italian and international conferences with referees), oral communications, poster. Membership: International Society of Urological Pathology (2016 - ), Oncology Pathology Working Group (2015 - ), European Society of Veterinary oncology (2014 -), Veterinary Surgeon Board of Queensland (2013-), CL Davis Foundation for the advancement of veterinary and comparative pathology (2013-), Australian Society of Veterinary Pathologists (2012-), International Veterinary Pathology Coalition (2012-), European College of Veterinary pathologists (2009-), European Society of Veterinary Pathology (2004-), Italian Association of Veterinary Pathologists (2003-). Ad hoc reviewer: Research in Veterinary Science, Avian Pathology, Journal of Laboratory Diagnostic Investigation, Histology Histopathology, Veterinary Pathology, Journal of Exotic Pet Medicine, PLOSOne. Is STAT3 and PTEN expression altered in canine prostate cancer? Gianella, Paola, Avallone, Giancarlo, Bellino, Claudio, Lussich, Selina, Palmieri, Chiara, Roccabianca, Paola, Salvatori, Claudia, Zanatta, Renato and D'Angelo, Antonio (2012) Primary cutaneous undifferentiated round cell tumour with concurrent polymyositis in a dog. Canadian Veterinary Journal, 53 5: 549-553. Palmieri, Chiara and Szarek, Jozef (2011) Wpływ podawania suplementu selenu matce na ciaże u ludzi i zwierzat hodowlanych. Journal of Elementology, 16 1: 143-155. Guglielmini, Carlo, Civitellam, Carla, Malatestam, Daniela and Palmieri, Chiara (2007) Metastatic pericardial tumors in a dog with equivocal pericardial cytological findings. Journal of the American Animal Hospital Association, 43 5: 284-287. Palmieri, C., Mascioni, A. and Della Salda, L. (2004) [Equine RAO (Recurrent Airway Obstruction) e SAID (Small Airway Inflammatory Disease): cytological features of the bronchoalveolar lavage]. Veterinaria Pratica Equina, 4 7-12. Mycobacteriosis in psittacines: a potential for zoonotic disease? Ultrastructural investigation of canine osteosarcoma cells killed by 17-AAG (17-allylamino-17-demethoxygeldanamicin) through autophagy/apoptosis/necrosis. Fidanza, A., Toschi, P., Czernik, M., Palmieri, C., Di Egidio, F., Zacchini, F., Loi, P. and Ptak, G. (2011). Insufficient placental vascularization causes defective heart development in sheep embryos produced in vitro. In: 4th International IVI Congress, Valencia, Spain, (). 7-9 April 2011. Borowicz, Pawel, Minten, Megan, Ptak, Grazyna, Loi, Pasqualino, Della Salda, Leonardo, Palmieri, Chiara, Scapolo, Pier, Cuomo, Amedeo, Jablonska, Zofia, Redmer, Dale, Grazul-Bilska, Anna and Reynolds, Lawrence (2007). Maternal placental vascularity and capillary endothelial cell proliferation during early pregnancy after transfer of embryos generated through assisted reproductive technology in sheep. In: 40th Annual Meeting of the Society for the Study of Reproduction: Meeting abstracts. 40th Annual Meeting of the Society for the Study of Reproduction, San Antonio, TX, United States, (205-205). 21-25 July 2007. Ogushi, Sugako, Palmieri, Chiara, Miyano, Takashi and Fulka, Josef (2005). Maturation and fertilization of pig enucleolated oocytes. In: Special Issue: The Society for the Study of Reproduction. 38th Annual Meeting of the Society for the Study of Reproduction, Quebec City Canada, (101-101). 24-27July 2005. Di Guardo, G., Agrimi, U., Della Salda, L., Terracciano, G., Marruchella, G., Bongiovanni, L., Malatesta, D., Romanucci, M., Mara, M., Palmieri, C. and Kennedy, S. (2003). Morbillivirus infections in free-living sea mammals: An overview. In: 21th Annual Meeting of the European Society of Veterinary Pathology (ESVP), Dublin, Ireland, (). 10-13 September 2003. Prostatitis and proliferative inflammatory atrophy: a fertile ground for canine prostatic carcinogenesis? Note for students: Associate Professor Chiara Palmieri is not currently available to take on new students.